to begin celebrating Earth Day early! Join us for our Holiday Open House! Meet local vendors and sample healthy, nutritional products. Check out all our special gift ideas for all the "Health Nuts" in your life! For some women, moving past forty is characterized by fear and uncertainty. But is should be a time of exploring fresh opportunities and embracing exciting new chapters in life. Ageology is a workshop that will provide an overview of the key building blocks you will need to enjoy this period with good health, a positive outlook, and a renewed sense of anticipation for what lies ahead. You will gain knowledge around areas like nutrition, movement and purpose and be encouraged to not only live but thrive in this dynamic season of life! A $5 registration fee required to register and hold your spot. Health Nut Nutrition will provide you with a $5 coupon off a $25 purchase. Space is limited and meeting room is not handicapped accessible. Did you know that there is a relationship between oral health and systemic disease such as diabetes and heart disease? Join Dr. Patty Powers and a local periodontist to learn more about the connection between oral health, inflammation and your overall health. This event is free but registration is required because space is limited. The meeting room is not handicapped accessible. Why is gut health so important? Join MegaFood representative, Sam as she explains the importance of digestive health and how to utilize a better approach to gut health. Come learn to “trust your gut” with supportive lifestyle practices, foods, and supplements. Sam will be providing some in-store coupons for MegaFood products! This event is free but registration is required as space is limited. We love our college students and are proud of you pursuing your education! We also want to help you stay healthy! Health Nut Nutrition and Millie’s Living Cafe present College Appreciation Day! Join us Saturday, October 13th from 9am-7pm, present your college ID and receive 10% off all day long! We will also have complimentary gift bags (while supplies last) and you can enter to win a grand prize giveaway! Remember, we also accept Flames 🔥 Cash! Join Dr. Patty Powers as she discusses who can benefit from detoxing. Learn more about how we are exposed to toxins and heavy metals and what we can do about it. You will leave with a better understanding of this important topic and 10 take home steps to lower your risk and improve your detoxifying strategy. The Longevity Center will be at Health Nut to offer thermal screening services on October 8 from 10:30 a.m. to 3:30 p.m. Considered by some to be an all-natural alternative to yearly mammograms, thermography is that and so much more. It’s a heat-sensitive body scan that creates thermal images to analyze for irregularities that could be signs of disease. With thermography, you can detect occurrences such as breast lumps, arthritis, back and neck pain, dental issues, sinus issues, headaches, carpal tunnel and more in a painless, non-invasive, compression-free and radiation-free way. To see more of what's going on at Health Nut, visit www.healthnutnutrition.com/events. Stop by Health Nut, say hello to Reagan and sample some of Garden of Life's new products! A representative from Intelligent Elixirs will be at Health Nut from 3-5pm on Wednesday, September 19 to teach you about their integrative clinical skincare line. We just love this line of professional level products that are healthy, clean, refined and non-toxin! This event is free! We look forward to seeing you! FAD diets, where do they FIT in my life? Fad diets are extremely popular for losing weight and often promise quick and easy results. Many times these types of diets are nutritionally unbalanced and ineffective over the long term. Join Nutrition Coach, Mitra Rash as she discusses types of diet plans that can be healthy, well-balanced and sustainable. Some of the diets Mitra will discuss include Keto, Paleo, Vegan, and Mediterranean. This workshop will include a lecture, followed by Q&A and a free, private 15 minute consultation afterwards if desired. Healthy food sampling will also be available and all attendees will receive a 10% off coupon for Health Nut Nutrition. It’s important to find a healthy way of eating that you enjoy and can follow for life! Cost $15 due upon registration. The Longevity Center will be at Health Nut to offer thermal screening services on July 16 from 3 p.m. to 7 p.m.
Let us know you are interested by RSVPing on the event page. Allergy Relief Class - Is all this pollen zapping your sunshine? Are you tired of sneezing and having watery eyes? Join our essential oil expert, Alva Saturday May 19th, 11am-1pm at Health Nut Nutrition to learn how to ease your allergies and restore your sunshine! Informative, fun, and scentually delightful! Recipes and a take home remedy included! Join Thomas, our licensed hair designer and cosmetology educator as he teaches the importance of healthy hair and scalp care. Thomas will be showcasing Health Nut's amazing essential oils that will benefit hair growth, increase shine, nourish your scalp and more! Additionally you will learn best practices for your unique hair type using some of Health Nut's hair care shampoos and conditioners. Please join Certified Herbalist, Kellie Stream as she discusses ways to use herbal teas, tinctures and capsule form to help fight seasonal spring allergies. Don't miss this timely and much needed teaching for allergy relief! $15 class registration due upon registration. The Longevity Center will be at Health Nut to offer thermal screening services on April 10 10 a.m. and 3 p.m.
Mitra Rash, will be hosting a sit-down Immune Boosting Dinner in the upstairs Community room at Health Nut Nutrition on Friday, February 23 from 5:45 p.m. to 7:30 p.m.
Come enjoy delicious food, bursting with immune boosting ingredients and learn how to strengthen your immune system and keep it strong. She will answer questions and distribute recipes so you can make them in your own home. Space is limited and sign up is at the store. Payment is accepted in cash or check. Beat the Winter Blues with a Class on Essential Oils! According to National Institute of Health data, roughly 6 percent of those in colder U.S. climates suffers from seasonal affective disorder (SAD)—while approximately 14 percent of that same population experiences milder seasonal mood changes (the winter blues). Telltale symptoms of SAD include plummeting energy, weight gain, depression, and mood swings. Join our essential oil specialist, Alva Pick, as she teaches how to combat these seasonal issues with several of Health Nut Nutrition’s amazing essential oils. Learn the many health benefits of each as well as their uplifting and emotionally balancing properties. A take home creation will be given to each class participant! Registration is $15, and due when you sign up at the Health Nut front counter. The Longevity Center will be at Health Nut to offer thermal screening services on January 23 between 10 a.m. and 3 p.m.
Health Nut Nutrition and Dr. Alexandra Cope are excited to offer a community health event to help you move forward with your New Year's resolutions! Dr. Alexandra Cope, Health Nut’s resident Naturopathic Physician, is passionate about empowering people to enjoy a better quality of life, naturally. On Monday, January 8, Dr. Cope will help navigate you through the know-hows of cleansing, losing weight sustainably, and getting into shape. Space is limited, so SIGN UP TODAY at HNN or online, and learn how easy and practical keeping your New Year’s Resolutions can be! We are SO excited to announce this years 2nd Annual Holiday Open House and Gluten-Free Bake Off will be December 9 from 9 a.m. to 3 p.m.
Assorted product samples will be available throughout the store. Space is limited to 20 participants, so sign up today! Keitha Cloudt of Keitha's Artful Garden will be at Health Nut Nutrition from 10 a.m. to 3 p.m. on Saturday, December 2 to showcase her STUNNING, new line of holiday soaps as well as men’s products such as shaving brushes and masculine-scented soaps. Also, for every Keitha's Artful Garden purchase of $10 or more on that day, Keitha will include a complimentary lip balm. Come support a local business AND your skin health at the same time. See you there! Join our amazing Alva Pick on Saturday, October 28 from 11 a.m. to 1 p.m. as she continues teaching on key essential oils that supplement your immune system for the coming cold and flu season. Alva will be building on her previous classes by targeting her discussion on anti-spasmodic remedies for respiratory health! In addition, all attendees will create their own take-home essential oil chest rub! To hold your spot for this informative class, register for $15 at the Health Nut Nutrition front counter. The Longevity Center will be at Health Nut to offer thermal screening services on October 9 between 10 a.m. and 3:30 p.m. 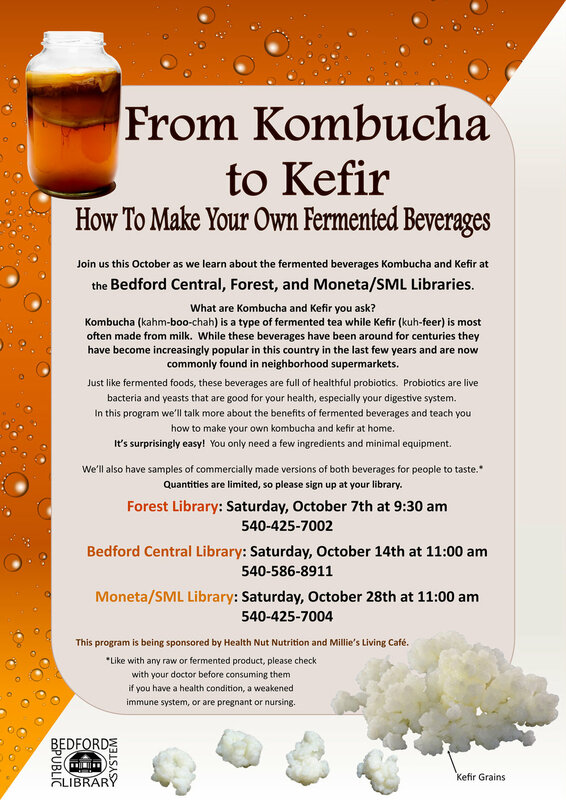 The Bedford Public Library System is hosting a series of events where you can learn about the fermented, probiotic beverages kombucha and kefir. These three events will be hosted at the Bedford, Forest, and Moneta/Smith Mountain Lake Libraries. On Saturday, October 7, we'll have a booth outside the store, right on Enterprise Drive to participate in the We Love Wyndhurst Community Event between 8 a.m. and 1 p.m.
— Millie's Living Cafe will be out there with us offering free samples from their menu! For more information about the overall event — which will include a Wyndhurst-wide yard sale, booths from other businesses in the neighborhood, giveaways, and a DJ — visit through to the official Facebook event. As always, we are here to inform you about the organic, plant-based products we have that are designed to help you live a happier, healthier, more sustainable life. Come see us soon! The 2017 Lynchburg Out of the Darkness Walk is taking place at Percival’s Island next Saturday, October 7, from 9 a.m. 12 p.m. This walk helps prevent and bring awareness to suicide by raising funds that support grants, legislation, programs, and community outreach efforts.